High in the Smoky Mountains of Western North Carolina, this luxurious, new Bed & Breakfast lodging sits in a peaceful, secluded mountain cove of woodland trails, meandering streams and llama-scaped pastures. You'll find three contemporary log buildings with nine romantic guest accommodations, a choice of many exotic, ethnic decors, bright, colorful rooms, high beamed ceilings, tubs for two, fireplaces, VCR's, comfortable lounge areas, decks and breathtaking mountain views. Some have kitchens. 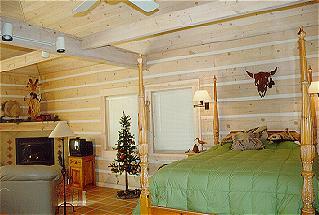 All have queen beds plus a twin or sofa sleeper. 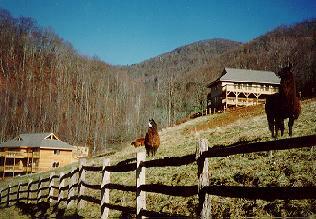 WindDancers is also a llama ranch and trekking company. On our surrounding 270 trail-filled mountain acres, or in the nearby Pisgah National Forest, our wonderful, wooly llamas work for a living. Our guides have selected beautiful trails. Our llamas carry the gear, supplies and fresh food for a exciting, gourmet adventure. Meet these gentle creatures and explore the ancient Smoky Mountains. This and other Clyde Bed and Breakfast Inns can be found here in The Register.